The extended England squad has flown to the USA for altitude training, but why go to Denver? Infinity Park in Glendale just outside the city was once the centre for American Rugby but as the game has expanded in the country so USA Rugby has moved its games to bigger stadia, Soldier Field in Chicago the venue for USA v Australia in September. So what was it about the Mile-High City that made it the choice of the England management? The truth is that this isn’t the first time that Stuart Lancaster has been to Denver and used its facilities. 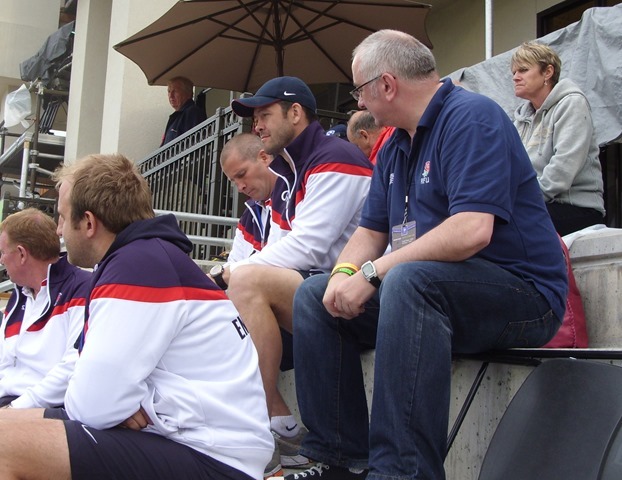 Back when Martin Johnson was England coach, Lancaster was the RFU Academies Manager, but he also has a second role as coach of England Saxons. At that time the Saxons regularly competed in the Churchill Cup, a competition designed to strengthen North American Rugby with Canada and the USA playing second string teams from Tier One nations such as England, New Zealand, Argentina, France, Ireland, etc. In 2010 it was the USA’s turn to host the tournament and they chose Denver as the venue for the pool games being an area of the country where rugby was growing, before moving to New York for the finals in a bid to raise the game’s profile to a wider audience. I was looking for somewhere to go on holiday that summer and thought that I would visit Denver during the Churchill Cup before moving on to other parts of the country. The coaches are not the only ones in the England party to be returning to the ground. When I looked back at the photos I took during my trip, no less than five of the current squad were with the Saxons in Denver: Alex Goode was at fly half, Alex Corbisiero at prop, scrum-half Lee Dickson and centre Brad Barritt were all playing along with Tom Wood who was then at Worcester Warriors. In the picture to the left you can see Goode, Dickson, Barritt and the top of Wood’s head. I looked up who else was in the squad and it included some other well-known names: Stephen Myler, James Simpson-Daniel, Luke Narraway, Tom Varndell all took part and won full England caps as did Nick Abendanon who was very much in the news after his performances for Clermont last season. There is link below to a video of the USA v England Saxons game with the team lists right at the beginning so you may spot some other names you recognise. From a personal point of view I met a number of new people, including Sky commentators Dewi Morris and Johnny Hammond, who showed us around the transmission truck, USA Rugby CEO Nigel Melville and Canadian Rugby legend Gareth Rhys. It was a memorable trip for me as it clearly was for Stuart Lancaster too.